Airborne weapon system is a set of devices comprising several weapons and delivery vehicles along with the integral equipment necessary for transporting or carrying the weapon system by air. A classic aircraft weapon system includes elements such as automatic gun fire control system, missile control system, fuse function control system, multiple weapon release system, and jettison system. The demand for a variety of airborne weapon systems has significantly increased in the past few years from countries wanting to safeguard their people from external or internal threats. The rising expenditure on military and defense practices across a number of countries, rising war disputes between countries, and a rising tone of instability on a worldwide level are factors that are driving the market. The global airborne weapon system market was valued at US$95.20 bn in 2016 and is expected to expand at a CAGR of 3.71% from 2017 to 2025. On the basis of aircraft type, the market is segmented into fighter jet and helicopter. The production of fighter jets across the world is approximately three times the production of helicopters. Fighter jets have features such as advanced stealth, sensor fusion, integrated avionics, and superior logistics provision with the most prevailing and wide-range integrated sensors. Advanced stealth allows aviators to infiltrate areas without being identified by detectors that legacy fighters cannot avoid. High defense spending in developing as well as developed countries such as the U.S., China, the U.K, India and Israel is one of the key factors leading to the increased demand for fighter aircraft segment in airborne weapons market. Therefore, the share of this segment is expected to rise to as high as 74.01% in 2025. In terms of the type of weapon used, the airborne weapon system market can segmented into bombs, guns, rifles, and missiles. In 2016, the missiles segment is expected to hold highest share in the airborne weapon system market. Among various weapons types, the missiles segment dominated the airborne weapons market followed by bombs in 2016 and anticipated to grow at a CAGR of 4.05% during the forecast period. Technological advancement in missiles to destroy enemy aircraft or helicopter at faster speed is one of the key factor driving the demand of missiles segment in airborne weapons market during the forecast period. Geographically, the report segments the global airborne weapon system market into North America, Europe, Asia Pacific, Middle East and Africa, and South America. 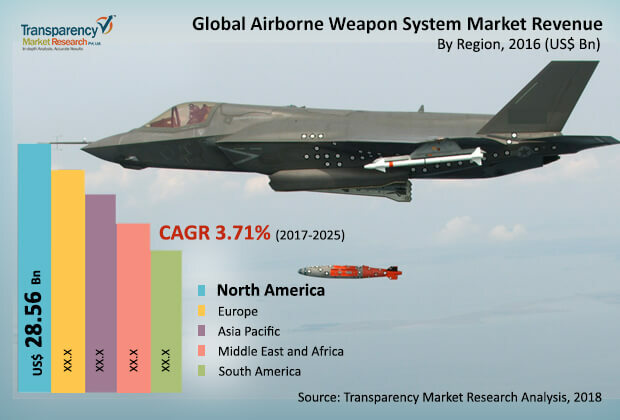 North America is presently the dominant shareholder in global airborne weapon system market due to its highest share in the production of fighter jets. Technological innovations in the defense weapons industry are not just oriented towards efficiency but also improved product quality and enhanced customer experience. Manufacturers in the region are coming up with path-breaking product features at a considerable price range to meet buyer’s expectations. Airborne weapon system industry players are expanding their presence in growing weapons markets such as China, Israel, and India among others where the operating costs are low and demand is rising. Some of the leading companies operating in the global airborne weapon systems market are Safran Electronics & Defense, FN Herstal, Boeing, Airbus, Ultra Electronics, Rheinmetall AG, SAAB AB, BAE System, Raytheon Company, and Lockheed Martin Corporation.